You’re busy, your life is hectic, you don’t have a lot of time for job searching, and you don’t want to be stuck to your laptop or use your work computer to job hunt. You don’t need to. Just like almost everything else in your life, job searching has gone mobile. Luckily for the dental industry, we looked and we have to offer an amazing platform that allows them to discover dental personnel and dental jobs without much of their time and effort wasted. Let’s see what the app is all about. What is Stop Gap Dental? Stop Gap Dental is an easy to use, simple and yet convenient and safe multi-purpose and problem-solving business platform for the dental industry to save time and effort, finding immediate temporary and future vacancies. 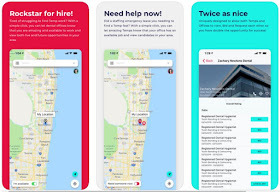 With the help of this job search app for Android and iOS users, you can easily find dental personnel or dental jobs, directly from your phone. On this app both dental offices and individuals get the chance to fully engage with each other, directly, connecting and communicating. To shine, just create your profile. Users need to share their experience, set their rate and select their skills, specialization, and services offered to find the best matches for them. The photo can be added from the user or the office, an introductory video also so others can learn more about the office or the user and what is offered. Dental personnel can be found easily by setting the availability. Individuals looking for temp jobs and office by adding future or recurring availability can plan in advance or by toggling ON can let people now they have immediate staffing emergency or became available in the last minute. Dental jobs can be found by sending bids for available jobs and temps can be found by sending requests. 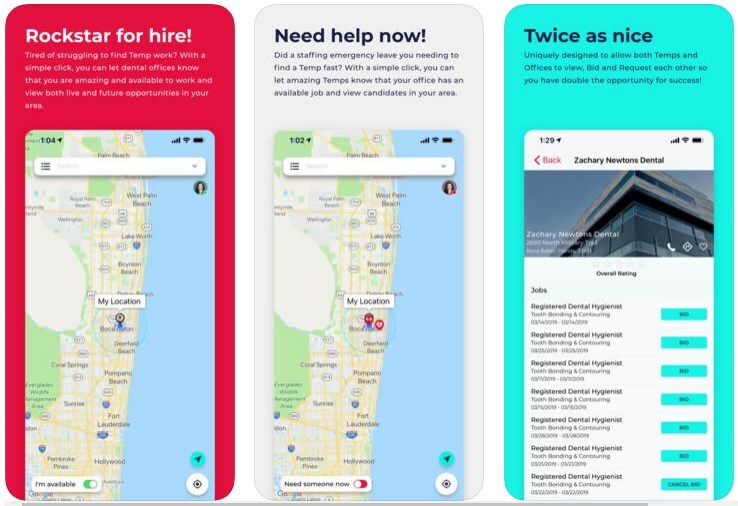 Users need to tap the job to navigate to the office easily, start and complete the job, submit the hours and get paid directly from the app and when that is finished, add the review to build your profile up. On the app are not required cost memberships or fees. The customizable map shows available dental personnel and temp jobs and users can search by keywords, using in-app communication. Receive notifications for available jobs and amazing temps, updates, reminders and special requests. Download it for free on Google Play and App Store to find available dental jobs or dental personnel!